Pontoons are quickly becoming one of the most popular types of boats. 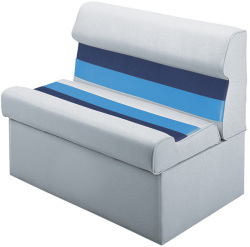 They are great for spending a day at the lake and are easy to restore ... read more with new pontoon furniture. 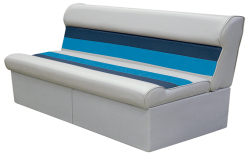 We have many types of pontoon boat seats (lounge, captain's, corner, folding, lean back, etc) which means you have endless possibilities for your pontoon furniture needs. 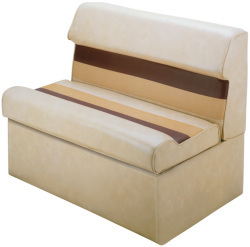 iboats.com brings you complete pontoon boat seat and furniture collections at low prices. 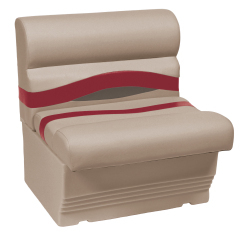 Pontoon seats are made from the highest grade marine materials ensuring your furniture is built to last. You'll find everything you need to replace your worn out pontoon boat seats or upgrade all of your pontoon furniture. Pontoon furniture, exposed to the elements, will eventually fade and break down. Nothing makes a pontoon boat look older and more run-down than ruined seating. However, the flip-side of that is that nothing revitalizes a pontoon faster than a new seat set. It's not difficult to replace your old pontoon furniture. It can typically be done in a weekend. 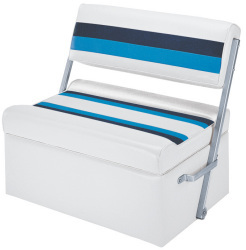 Order quality pontoon seating from iboats and hit the water in furniture that is brand new and feels great! Hi, I’m Ron Winterson from Wise company, I’m here with Ryan Boyd. We’re here to show you just how easy it is to install Wise furniture on your pontoon. Ryan is going to tell you about the deluxe series here. This is our deluxe series. 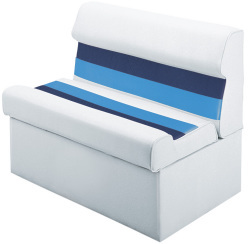 It has a UV and mildew resistant marine grade vinyl, coupled with high compression foam padding. This sits on top of injection molded sub gates. All of this on top of a rotationally molded bases. This is the premier series. It’s got UV resistant, marine grade vinyl. Soft touch vinyl. It’s deeper, plusher than our deluxe series. Deeper seat depth, higher backs. And more options for your boat. We have options available on our website. If you want to look at preconfigured groups, or you can custom layout your boat to your specific wants and needs. Today, we’ve chosen a ’91 Fisher boat we’re going to outfit, and we’re going to take you through the steps of assembly, deck measurement, and any other things to look for before you make the important decision to purchase furniture. We want to make sure you get your furniture right before you receive it. We’re going to try and eliminate any problems and take you through those steps. Okay, your next step when you receive your furniture you want to make sure you are really careful in opening it. You generally don’t want to use a knife like this because it is upholstery and is susceptible to damage. Generally we recommend a good old set of car keys. That way your sure not to damage your goods. Upholstery can be damaged from the box sometimes. Also, when you receive your boxes, make sure they are not damaged. Because at that point you can refuse it from the freight line. That’s the easier way to take care of it, than down the road. As you can see the furniture can be close to the front so generally you don’t want to use a sharp knife. Okay, we’re going to take our furniture out of here and start assembling. Okay, we’ve just received our furniture, and have unpacked it. We’ve inspected it and everything looks good. Each package comes with pretty clear instructions to help in the assembly. We’re going to just take you through it once to just verify. It’s simple. The bases come with inserted “T” nuts. And the stubs we’ve already started to assemble this. We’re going to install these last two studs in the base. All the hardware comes in the package. So you just finger tight the studs. And the backs are held in place by wing nuts and fender washers. So, we’ll mount the back here. We’ll go ahead and tighten it down with the wing nuts and our fender washers here. Next step will be the seat base. Get them nice and tight. Okay, the next part of the assembly is the seat base. This really helps to have friend with you. So Ryan, let’s get this in place. What we’re going to do is set up the hinges on the recesses in the base. We’ve already got our screw driver torqued. Because you don’t want to stripe your base with the screws. So we’re just going to go ahead and mount this in. Can I hold that for you Ryan. We’re going to go ahead and get both sides tacked in here. Before we get them too snugged down, we’re going to check the fit. Make sure everything is looking good. Okay, let’s go ahead and do the rest of the fasteners here. Now, this assembly is typical of all the bases, as well as the cornerbacks and leanbacks. 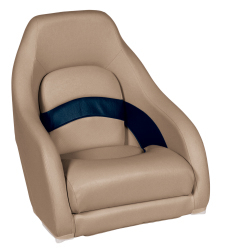 This is a simple operation and you’ll have your seats and backs together and ready to install. Okay, we are on the deck of our 1991 Fisher Pontoon and we’ve striped the furniture, inspected the flooring and sub structure, and everything looks good. We’re ready to install. We’ve measured from bow to stern and the beam length and have taken into consideration any bracketry and any pre-existing mounting locations that may interfere with your installation. Those features you want to look for are your support brackets in your rail, any type of corner radius you have, whether it is an 8” radius or full bow radius. And those are important features you want to take into consideration before you order your furniture. One additional piece of information that will be good for you, to match your furniture, the transom cushions are also warn, you can order the material to recover those cushions from our website. Okay, we have pre-positioned our new furniture just to check the fit to make sure everything is looking good before we mount it down. One thing I want to note is that the furniture does not come with anchors for mounting your seat. What we’ve done here, and what typically happens is we’ve salvaged the hardware from your tearout and utilize them in the installation. We’ve got plenty of fasteners from our tearout. If you need some, we recommend that you get some stainless steel fasteners and some finishing washers to help you anchor those down. Ryan, let’s go ahead and take you through a typical mount which will really include all the components that will mount pretty much the same way. We’ll show you a bench and maybe an arm rest that should take you through the rest of the installation. We now have our furniture in place. We’ve checked for fit to make sure we don’t have any interference between the units. Looks like we’ve got a good nice, tight fit. Ryan’s going to go ahead and screw the bases to the sub floor. Using our stainless steel fasteners that we salvaged from the teardown. Typically we use four fasteners per component, and that will be adequate. In some instances you may want to screw the back to the rail in your application. With some careful team work and careful planning, we’ve knocked this project right out. We sure did Ryan, and it didn’t take too long. We took an old boat and made it practically brand new. We have some really, nice comfortable seating. This boat will be good for quite a few more good years. Any additional information you may need, please look at the website. We’ve got templates and contact information. Enjoy your furniture, and be safe in the water. Remove your pontoon boat seats from the pedestals/mounts and bring them into an open area where you will have plenty of room to work. Proceed to remove the hardware, screws and other components of the seats. Place everything you remove and place them into labeled Ziploc bags (that you will designate with your markers). Be sure to label and sort the hardware into bags that are specific to each seat. Remove the vinyl from the seat: Flip the seat over to get access to the staples holding the vinyl to the seat, and carefully remove the staples with your pliers. The vinyl that you will remove will aid you when copying the same patterns with the new vinyl so be careful not to mutilate it in the removal process. You will want to use only a good quality seam ripper for this next step as vinyl is much tougher than most fabrics. Use this seam ripper to disconnect the various vinyl pieces that make up the entire (original) vinyl covering. Lay the vinyl pieces out to allow for easy tracing, then trace the outline to the new seat vinyl. It’s always a good idea to cut the vinyl with a 1/2 inch buffer. Once you have cut the pieces to the same pattern as your old fabric, you can start pinning, marking, and sewing. Once you have worked out the fabric details, get to work on the foam. Shave away and reshape the residual, used foam. Do not try to reuse any damaged foam. Instead, add the new foam in its place. The adhesive will help keep the foam together as you work to shape it to its original form. You may not get it exactly as it was before, but do the best that you can. After you have shaped the foam and set it in place, begin to pull the fabric over the foam as tightly as you can. Fit the vinyl around the frames and staple it as you go, pulling the fabric as tight as possible. Stainless steel staples are highly recommended, especially in salt water applications as they will last much longer.